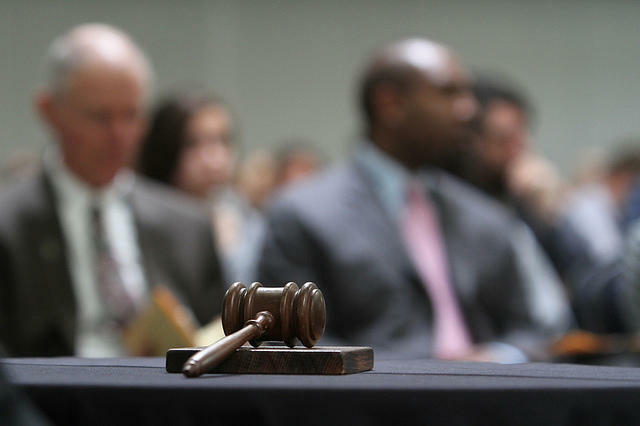 Today on Stateside, will the 44,000 people who were wrongfully accused of unemployment fraud be able to sue the state? 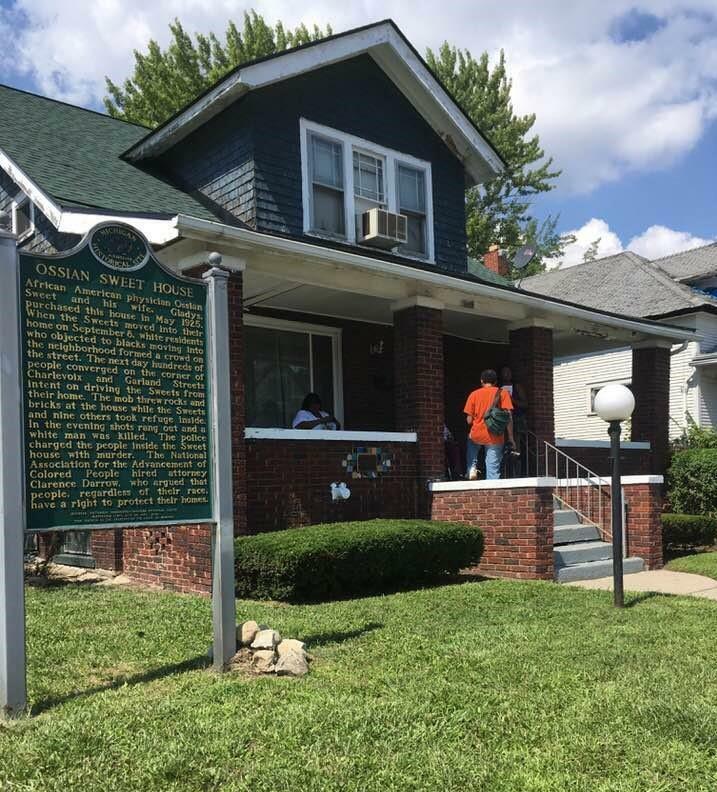 Plus, the legacy of the 1920’s African-American Doctor who purchased a home on Detroit's segregated East Side. A bipartisan group of lawmakers has come up with plans to overhaul the state’s Unemployment Insurance Agency in hopes of stopping future efforts like one that led to thousands of people being wrongly accused of fraud. A workgroup developed the plan in response to a scandal at the agency -- an agency computer system erroneously said 37 thousand people collected benefits they weren’t entitled to. The state then sanctioned them quadruple damages. Stateside's conversation with Zach Gorchow, editor of Gongwer News Service. 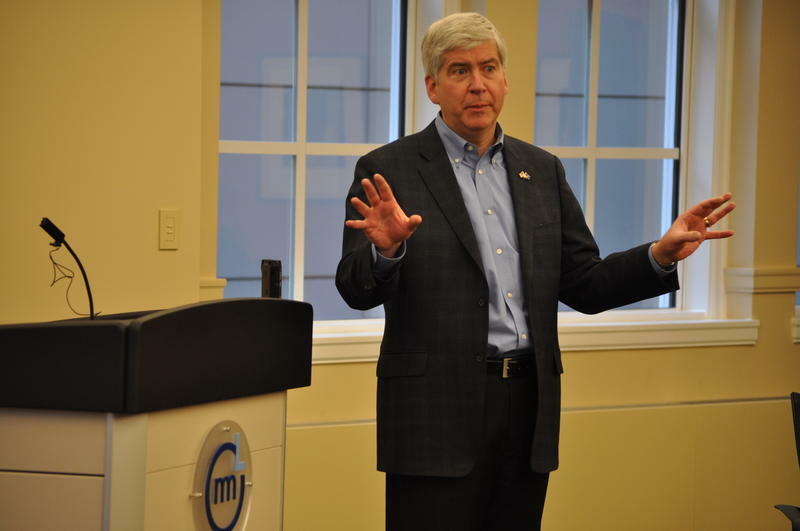 After wrongly accusing tens of thousands of people in Michigan of cheating on their unemployment benefits, the state is refunding $21 million to those Michiganders. Attorney Jennifer Lord said that number is just “a drop in the bucket” of what the state has taken from those people, while Director of the Talent Investment Agency Wanda Stokes said the agency would do better in communicating with citizens and handling unemployment claims. Amidst all of this, Zach Gorchow of Gongwer News Service has noted a conspicuous silence from one very important voice: Governor Rick Snyder. LANSING, Mich. (AP) - The state of Michigan says it has reversed 70% of unemployment benefit fraud cases and is refunding $20.8 million after people were wrongly accused of collecting excessive benefits. 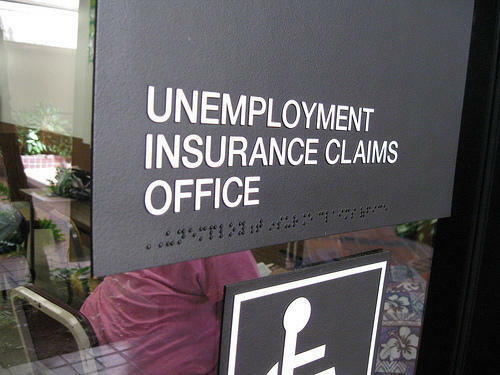 The Unemployment Insurance Agency announced the results of a review Friday. It reviewed more than 62,000 cases for people who were assessed a fraud penalty and did not seek an appeal. About 44,000 cases were reversed. Michigan has been under fire for a computer system that wrongly churned out cases of fraud. Last month, it dropped criminal charges against 186 people. The Ingham County Sheriff's Office announced this week it will no longer detain people at the request of immigration, without a judge's order. It says immigration violations are "civil, not criminal, in nature, and are between the individual and the U-S Government." The Wayne County Sheriff's Office has a similar policy in place. This Week in Review, Weekend Edition host Rebecca Kruth and senior news analyst Jack Lessenberry talk about whether other counties will follow suit. The state of Michigan is dropping charges and arrest warrants against nearly 200 people accused of illegally collecting unemployment benefits. The warrants were issued against people who never showed up for court hearings after they were accused of defrauding the unemployment system. In many cases, the accused never knew they were charged with a crime. The Michigan Talent Investment Agency asked for the arrest warrants to be dismissed because there’s a good chance the people accused actually didn’t do anything wrong. The Michigan Court of Appeals dismissed a lawsuit claiming the state wrongfully accused thousands of people of unemployment fraud. In 2013, the state started using an automated system to flag fraud cases. But the system wrongly identified tens of thousands of people – and some of them sued to get their money back, plus fees and interest. But the court says they waited too long to file the lawsuit. 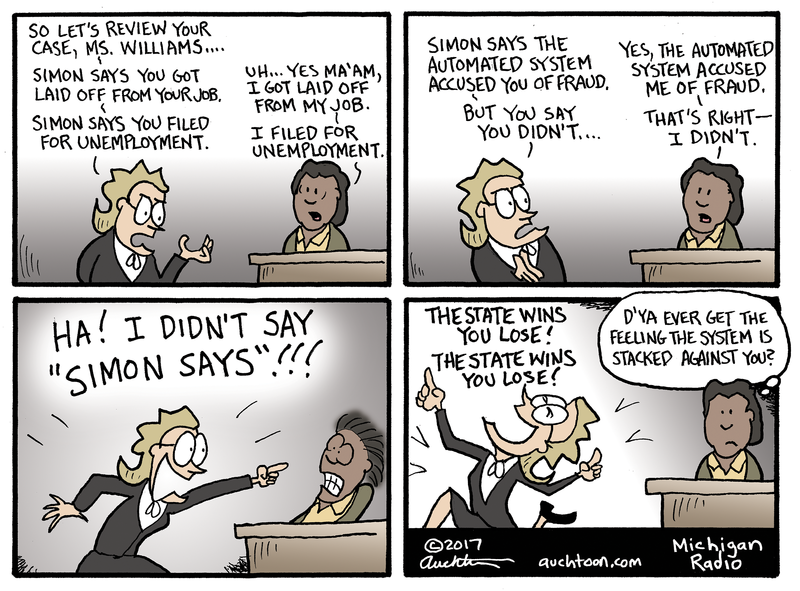 Auchter's Art: Wrongfully accused of unemployment insurance fraud? Too bad. We've all been caught in the grinder — whether it's government (the IRS saying you owe money for a property you never owned), business (the cable company charging you for a box you returned in 1997), or even a well meaning non-profit (you accidentally getting signed up with Pups That Poop — a canine rescue for large dogs with bowel control issues — who now contact you every day to insist a Great Dane named Balthazar would be perfect for you and your studio apartment). Attorneys for a number of people who say the state of Michigan wrongfully garnished their wages or seized their tax refunds hope an appeals court will rule quickly in their case. Karl Williams says he’s one of tens of thousands of people who were wrongly accused of fraud by the state’s automated system for unemployment insurance. The Lansing resident says the state is still garnishing his wages. He’s been working a ton of overtime to make ends meet.